Once you are logged into CYMAIV, change to the module you want to add the custom report into. Inside that module, choose the Reports menu. Click the Add Custom Report button, on the bottom of the Report List. When the Add Custom Report button is clicked, the Add Custom Report dialog is displayed. 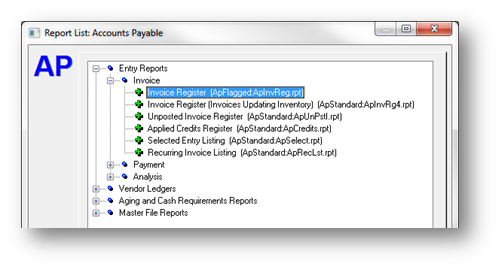 This allows you to add your custom report to the Report menu tree structure in the selected module. 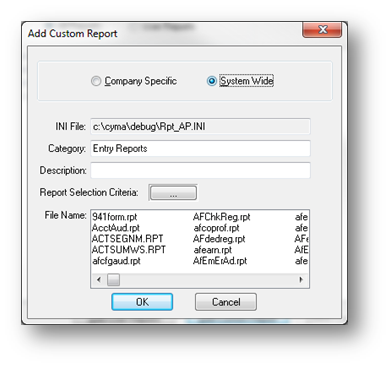 In the Add Custom Reports dialog, the first selection to make is on the top Company Specific or System Wide. The choice of Company Specific or System Wide has to do with both where the custom report has been saved and who in CYMA can see it after the report has been added. Company Specific indicates a report that has been saved inside this particular company that you are logged in to’s company data folder. It also means that this report after being added will only show on the report list if your logged into this company; if you change to a different company it will not appear on the report list. System Wide indicates a report that has been saved into the main CYMA4 program directory. Any report that’s been added as System Wide will show on the report list for any company that you log into. Click the System Wide or Company Specific option that matches where you have saved the report. The Category is a user-defined report category. The Category field is populated with whatever category was selected when you pressed the Add Custom Report button. These are the blue dots for the different groups of reports on the report list – things like Entry Reports, Ledgers, etc. It is not possible to add a custom report to a pre-existing CYMA category so if you reuse an existing category name it will just add a new one to the end of the list with the words (Company Specific) or (System Wide) afterwords. Example, if you tried to reuse Entry Listing you would get a new Entry Listing (System Wide) as a new category at the end of the list. For this reason I would recommend creating your own category. If you don’t forsee having many custom reports to categorize you could go with a simple category like using the words CUSTOM REPORTS. The Description is a user-defined report name, such as My Report. This is the name that will display in the custom category on the Report Menu. Enter whatever you want into the Description field for the name of the report as it will show on the report list in CYMA. The next option is the Report Selection Criteria line. The Report Selection Criteria button (…) allows you to associate the front end that goes with a stock CYMA report for use with your custom report. Using this is optional, if you skip this you can add a report to CYMA and it will run no differently than it does inside of Crystal Reports. If you are not using it then just go on to the next section of this write up now. If you do use this option it will give you the option to have a CYMA front end that could be used to filter your report for various things like Vendor, Date, Account Number, Year, Product, etc. How well this front end filter will work for you depends on how close your custom report matches up to the files used by the existing CYMA report that your borrowing the front end of. If they do not share the same files the resulting front end will likely result in error messages and or blank results when the report is run. Clicking on the […] button will bring up the Report List again for this module. To choose a front end select an existing report and click on the OK button. 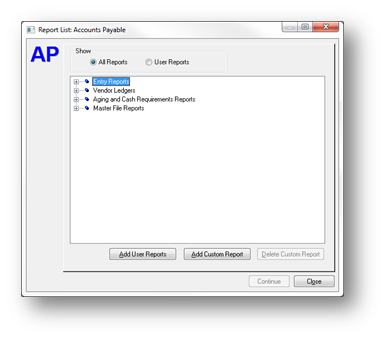 You will be returned back to the Add Custom Report dialog. The last choice is Filename. The Filename box lists all the files, in alphabetical order, that exist in either the companies data folder if you selected Company Specific or in the main program directory if you chose System Wide. Find your report in the Filename box and select it so it is hilighted. Review the information you’ve entered and if your happy with it then Press OK. The report is now listed in this module in the CYMA Reports menu.